Legal Roundtable: The Gun Bill And The Veto Session, Connor's Non-Compete, Pujols Libel Case, Etc. 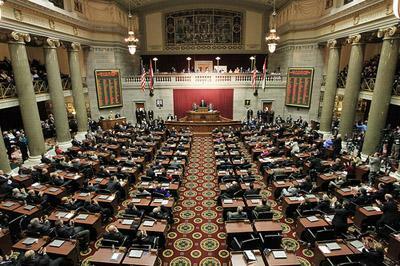 During next week's veto session, Missouri legislators will likely attempt to override Governor Jay Nixon's veto of the gun bill (H.B. 463), called the Second Amendment Preservation Act. 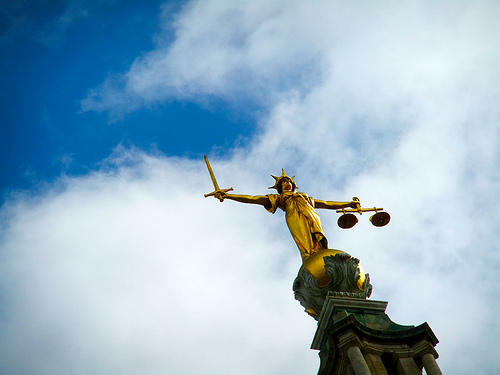 Missouri Attorney General Chris Koster has announced that he agrees with Nixon's override, stating that the bill violates the Supremacy Clause of the constitution. If put into law, the bill would conflict with federal gun laws. 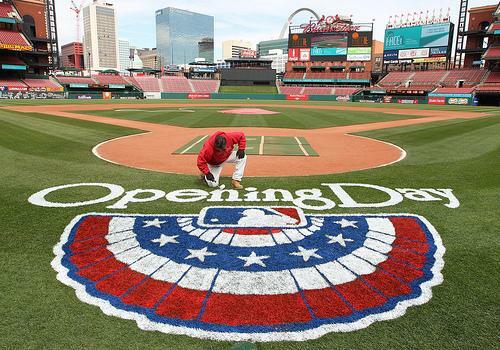 A home opener against the Cincinnati Reds, a record number of interleague games, and the first showdown with the Los Angeles Angels of Anaheim since they lured away Albert Pujols are among the highlights of the 2013 St. Louis Cardinals schedule, released today by Major League Baseball. The season opens April 1 with a game against Arizona. The home opener is a week later. 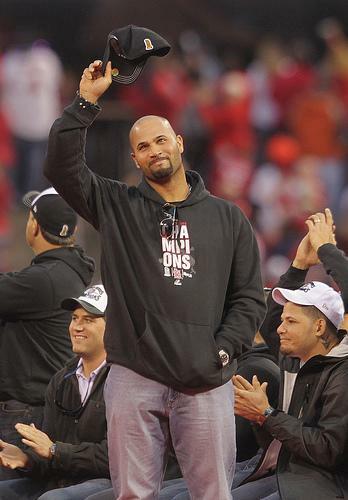 Guess $240 million wasn't quite enough for Albert Pujols. In addition to his salary, the Los Angeles Angels are giving the slugger four season tickets to home games over the next decade. He and the Angels still need to work out the location of the seats, which are his to enjoy for the duration of his contract. After that, if he still wants them, he has to pay. Those details were contained in the terms of his deal that was filed Thursday with Major League Baseball and the players' association. This article first appeared in the St. Louis Beacon, Dec. 15, 2011 - Somewhere within the ocean of news ink devoted to the departure of Albert Pujols from St. Louis to Anaheim, I read that the slugger had prayed for divine guidance while contemplating his options as a free agent. If that report was accurate, it's not surprising that he split for the coast because you'd have to figure that God would wind up playing on the side of the Angels. 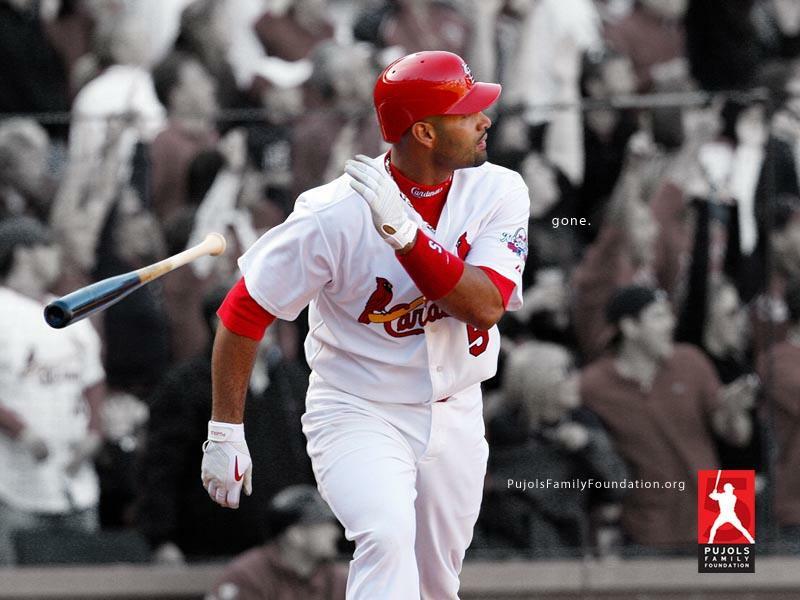 The iconic Cardinals slugger is signing with the Angels and taking his talents to Los Angeles, raising some concerns about what will happen with the Pujols Family Foundation that benefits people with Down syndrome. But executive director Todd Perry told the St. Louis Post-Dispatch that the foundation will remain active in St. Louis, though it could expand to include programs in the Los Angeles area. He isn't yet sure if the headquarters will remain in St. Louis. Updated 9:59 a.m. to include information about deal possibly reaching $260 million. Updated 11:54 a.m. to include comments from McNeal & announced deal amount. This article first appeared in the St. Louis Beacon, Dec. 6, 2011 - First, yes, this is serious. 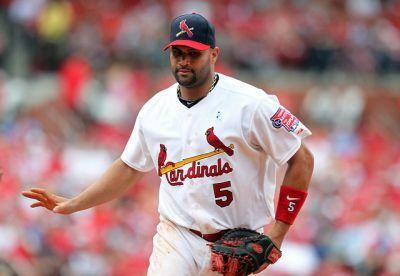 Word on the net is that the Miami Marlins have offered Albert Pujols a 10-year deal worth more than $22 million a year. The Cardinals are said to be the only other team in contention for the first baseman's services. Tis article first appeared in the St. Louis Beacon, Nov. 2, 2011 - Another day, another headline-grabbing St. Louis Cardinals event. With David "MVP" Freese signing baseballs at Macy's Galleria tonight at 6 p.m., perhaps we should call it "Shopping Mall Wednesday" in this Cardinals World Series championship week. This article first appeared in the St. Louis Beacon, Oct. 31, 2011 - The first thing that Chuck Korr tells you when you ask him about Tony La Russa and the World Series is that, as a Phillies fan since 1948, he wishes Philadelphia had been the world champions. But after spending 41 years in St. Louis, the emeritus professor of history at the University of Missouri-St. Louis who has written widely about sports also acknowledges that if the Phillies had to lose, he was glad the Cardinals were winners. Albert Pujols had one of the biggest postseason nights of his career in Game 2 of the NL championship series, going 4 for 5 with a home run, three doubles and five RBIs as the St. Louis Cardinals beat the Milwaukee Brewers 12-3 last night. This article first appeared in the St. Louis Beacon, Oct. 6, 2011 - Judy DeFrancesco of St. Louis was all smiles Wednesday night as the Cardinals beat the Phillies 5-3 in Game 4 of the National League Division Series. "I love it. I love it,'' said DeFrancesco, who wore a No. 5 Albert Pujols jersey and a red plastic batting helmet with a cardinal yard ornament perched on the top. David Freese homered, doubled and drove in four runs as the Cardinals tagged playoff nemesis Roy Oswalt and beat the Philadelphia Phillies 5-3 Wednesday night, forcing a deciding fifth game in their NL division series. Edwin Jackson recovered from a rocky beginning to win his first playoff start with six solid innings. Jason Motte worked a perfect ninth for his second save of the series. 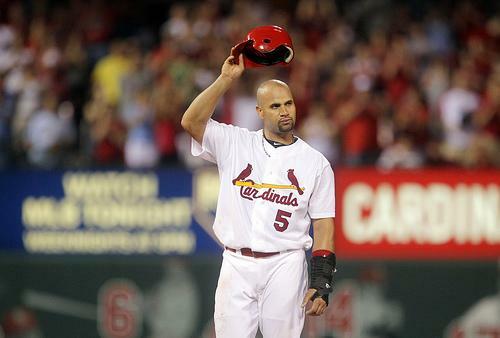 Albert Pujols hit a go-ahead single in the seventh to give the St. Louis Cardinals a 5-4 win over the Philadelphia Phillies last night. 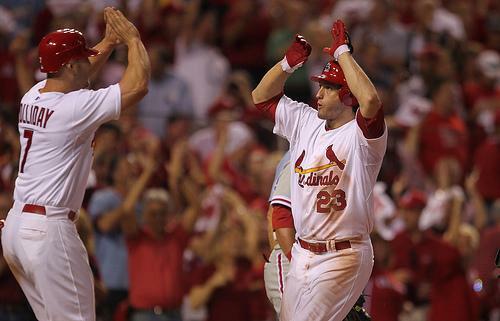 John Jay added two RBIs for the Cardinals, who evened the National League division series matchup at one game apiece. St. Louis will send Jamie Garcia to the mound tomorrow in game 3. 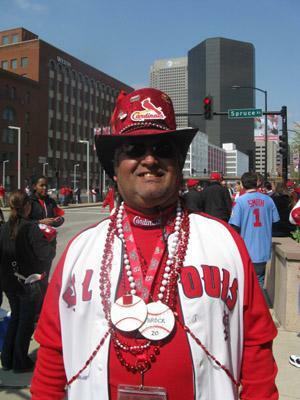 This article first appeared in the St. Louis Beacon, July 16, 2011 - He's baaaaaaack. But for how long? Even with a mediocre start by his standards, Albert Pujols is still the most feared hitter in baseball -- and he's still probably worth $300 million under a multi-year deal. 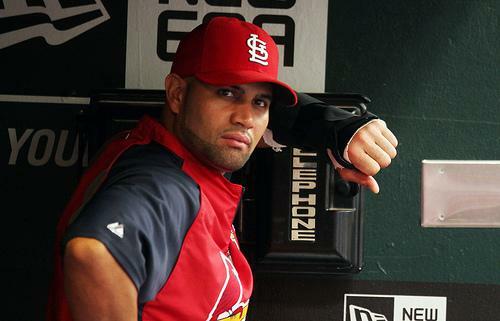 Though he has expressed a desire to stay in St. Louis, the fact is that Pujols may have fewer than 80 games left with the Cardinals. Albert Pujols says he has no pain in his broken left wrist and the St. Louis Cardinals are hoping to get their top slugger back in the lineup sooner than expected -- maybe tonight. He'll be examined by team doctors today. St. Louis Cardinals fans got some bad news today. Star first baseman Albert Pujols will be out for 4-6 weeks with a fractured left forearm. The team announced the results of an MRI and CT scan today, one day after Pujols was injured in a game against Kansas City at Busch Stadium. Pujols was hurt on a play at first base in the sixth inning. He was fielding a throw that was off-target and Kansas City's Wilson Betemit collided with his glove hand as Pujols was pulled toward home. The Cards' three-time MVP went down to the ground in pain. Albert Pujols is about to begin what could be his final season with the St. Louis Cardinals. 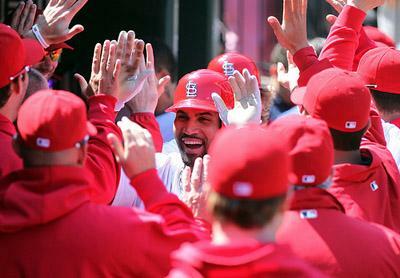 The team expects a rousing welcome for the three-time NL MVP, even though Pujols is playing hardball off the field. 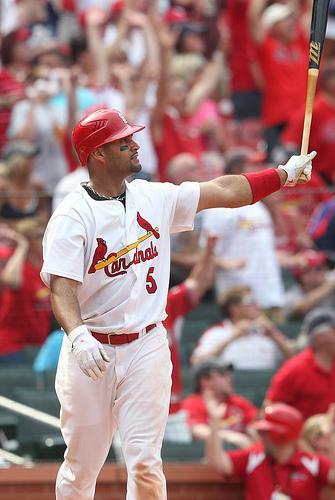 Year 11 for Pujols, all with the Cardinals, begins today at Busch Stadium against the San Diego Padres. Game time is 3:15 p.m.